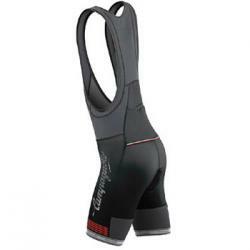 These are stylish, functional and understated racing version bib shorts. They are made from Lycra "Atlanta" techno-fabric, that promotes correct muscle compression for improved technical performance. They have a three-layer anatomical AirPro Pad, elastic mesh inserts on back and inside of leg for efficient constant air circulation and evaporation and flat seams for next-to-skin comfort. They also have back pockets, visible elastic with Campagnolo logo and reflective logo and side edgings.